Dating back centuries, symmetrical rooms have a neat, ordered and aesthetically pleasing look to them. As it’s easier for our brains to recognise such designs, we don’t have to work as hard to process them, and hence they often make for much more calming, peaceful spaces – just the sort of feel you want to create in your home. Conversely, asymmetrical spaces can appear awkward, disorganised and messy, consequently having a negative influence on our mood. If you’re lucky enough to already have a symmetrically shaped kitchen, then your job is easy. If it’s asymmetrical, however, then a little more thought will need to go into the design process. But there’s no need to fret! With the right advice, it’s easy to trick the eye into thinking a room is more symmetrical than it really is. This post will talk you through how to create a balanced and harmonious kitchen that you look forward to spending time in. First things first, choose a pivot point to focus your attention and anchor the room. This should be the first thing that catches your eye when you walk in, such as a central item of furniture – often the room’s main function. In the kitchen it could be a dining table in the centre of the room, a large range cooker, or the sink, often located under a sizeable window. Every other element in the room should then stem from this piece and work around it. Why not make a statement with a kitchen island situated in the middle of the room, with kitchen stools neatly arranged alongside it. Next you should aim to create a mirror image on either side of your focal piece. As well as considering furniture, don’t forget to think about other décor pieces such as curtains, artwork and appliances too. 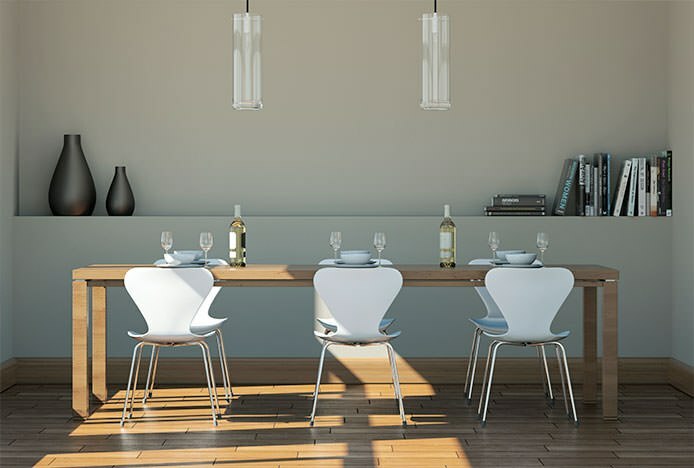 Try positioning your table with an equal number of dining chairs along either side, with artwork on the wall above it the same width as the table. 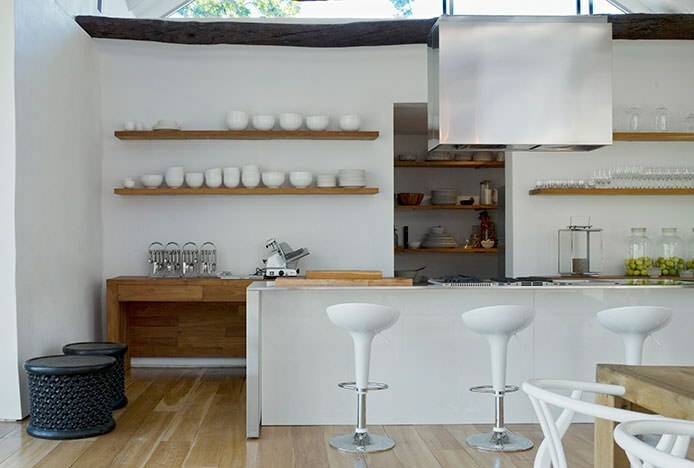 Another example that would restore a sense of balance and order to a kitchen could be to symmetrically arrange cooking implements, accessories or food containers along open shelving. 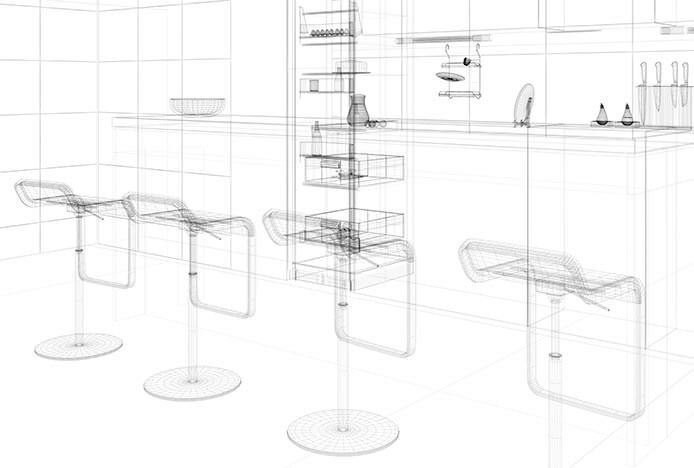 Along the kitchen counter you may wish to opt for fixed height kitchen stools instead of gas lift designs with variable height and 360 swivel functionality. Their immovable frames mean they can’t be left at different heights and angles, and hence lend a much neater look. Picture your kitchen as a grid made up of vertical and horizontal lines, then use them to your advantage to influence the overall look of the room. 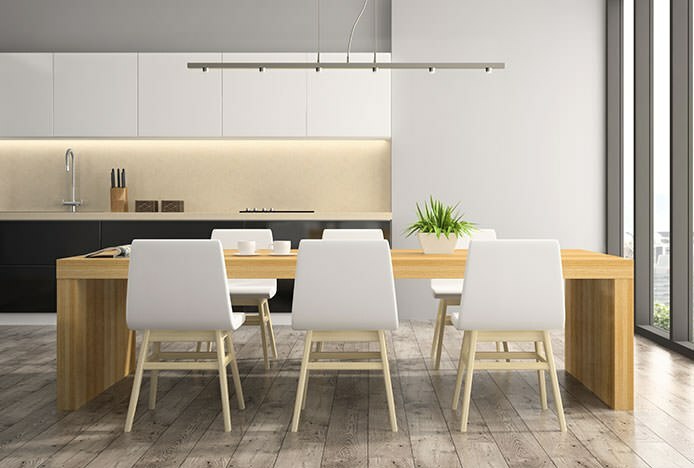 Symmetrical vertical lines, found on items like floor to ceiling kitchen cabinets, long curtains or dining chair designs like the Roma Dining Chair Oak & Stripe, will heighten a room and create an enhanced sense of space. But don’t go crazy! Pair them symmetrically with horizontal and vertical lines, as seen on the backrest of the Jasper Bar Stool, to create a balancing aesthetic. You may not think it, but both colour and texture are key in creating a symmetrical room. The trick is not to go crazy and pull in too many shades or materials, with random pops of colour here and there. Instead aim for unity and consistency, choosing a few matching shades and complementary textures that all tie together. For example, pair brushed steel kitchen appliances with brushed steel dining chairs, or oak cabinets with an oak dining table. With everything in harmony, it will create a much more visually pleasing kitchen with a relaxing sense of oneness. A common mistake people make when trying to create a symmetrical interior is to use décor pieces of a uniform size, thinking everything needs to be of the same scale. But did you know this can have the opposite effect, lending a boring a predictable look? Whilst too many small items can come across busy and chaotic, too many larger décor pieces will appear overbearing and domineering. Instead, we recommend opting for both big and small-scale decor pieces to create a more balanced appearance. In fact, larger pieces of furniture are ideal for drawing attention away from awkward asymmetrical spaces. Why not place our Fleur Chair in an uneven corner or alcove kitchen space. It’s generous size and sumptuous style will hide a multitude of sins. When laying out your furniture, think in terms of visual weight. Don’t just focus on the size of individual items, but consider the spaces in between them too. 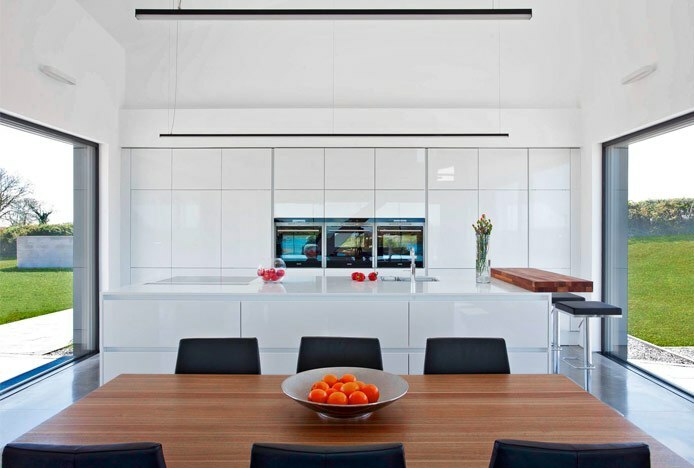 In order to achieve a harmonious look in your kitchen, the negative spaces in the room must also be symmetrical. One final thing: don’t go overboard with the symmetry. Remember, there must be some asymmetry for a symmetrical room to succeed. Once you’ve carefully created a well-ordered space, break it slightly. This is great news for the kitchen, which typically houses an assortment of cooking appliances and accessories. You’ll find lending a small asymmetrical element to the room will end up emphasising the symmetry of your kitchen as a whole. Making for much more visually interesting spaces, your small acts of rebellion will ultimately lend depth, character and a more homely vibe. 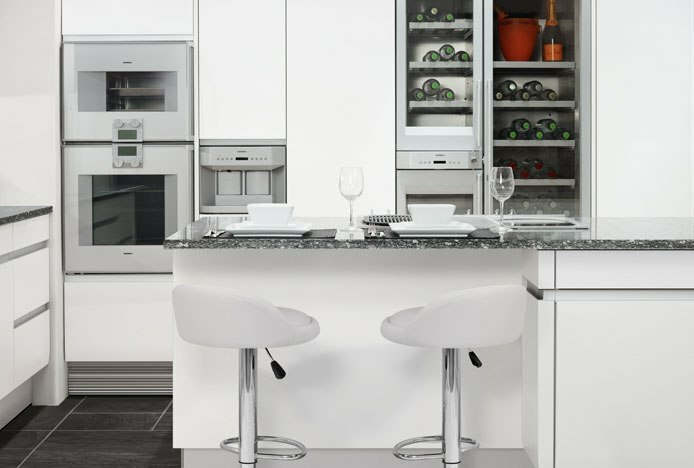 For a welcoming and refreshing kitchen, you need to optimise the Feng Shui.. Discover how to turn your kitchen into a glamorous space full of luxury.. Discover what this Japanese philosophy means and how you can use it..